Run in place, bringing knees high to touch left hand to right knee, then right hand to left knee. 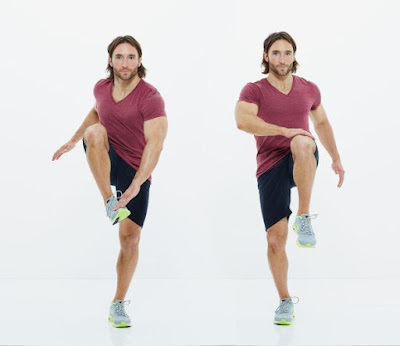 Next, tap left hand to right foot (as right knee lifts), then right hand to left foot (as left knee lifts). Repeat, tapping knees, then feet, as you go. Continue for 30 seconds, doing as many reps as possible.